Three Points of the Compass is not only keen on hiking, but he is also a poor but aspiring artist. I often include sketches in my trail journals not only as a record of my trip, but the very act of sketching forces me to look more closely at a subject. My sketches may be strictly amateurish, but I remember the moment I made them very clearly. If sketching, there is no need for specialist equipment. Almost anything to hand will do. However good artists’ materials, especially if familiar, will mean that I am happier with my results. I can work quicker and with more confidence. However almost all of the ‘lightweight’ art kits you will find described elsewhere, are mostly impractical for a lightweight set up to take hiking. To this end, I have been refining and reducing not only the weight and amount of materials I take with me on a hike, but also its bulk. This is the first of a series looking in turn at the various elements of my art kit that I have used in the past, a few thoughts on each piece, with a distillation down to what will eventually accompany me on my Long Walk. I haven’t looked at every medium there is, by no means. I have virtually no experience of oils and acrylics. I dabble in pencil sketches, either graphite or colour, enlivened on occasion by watercolour. I like to use ink, preferably a fountain pen for the increase in expression that these give, but technical pens have been a mainstay of my art kit for many years. We shall see what my refinement of weight and bulk has permitted me to keep. If taking a pencil on a hike, you may as well take a decent one if you intend to use it for anything artistic. Small things like good quality wood, finish, shape and actual drawing/writing ability should be top quality. Splintering poor quality wood in a sharpener, uncomfortable in the hand and a poor impression on paper are soon going to annoy. So instead of settling for a freebie from the office, pay a bit more money for a good product. A good pencil isn’t going to make a good artist, but it isn’t going to hold back the development of one either. So I look here at far more choices than is sensible, or even reasonable. When deciding the contents of my lightweight, low bulk art kit, I like to include at least one traditional wood-case pencil, or at the very least, incorporate a clutch or mechanical pencil. This is quite a wrench for me, eschewing my lovely Derwent canvas pencil wrap and my favourite 29 pencils is a struggle. But in all honesty, many of the contents rarely get used. When drawing with pencils I find that I am not using anywhere near the full range on offer and it is the 2H, H, HB, B, 2B and 4B I am using most. 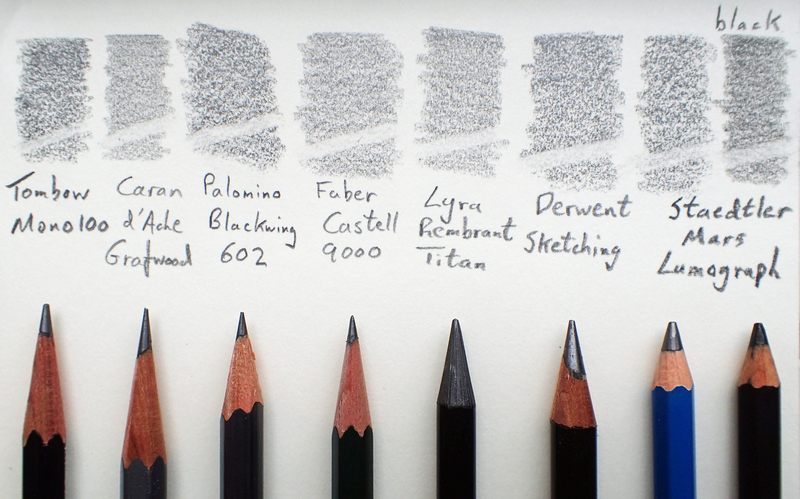 Of these, my preference with pencils is for a fairly soft graphite ‘lead’ of 2B or similar. For a truly lightweight art kit, I am limited myself to a solitary pencil. Within this 2B grade there are quite a few choices of good pencil from which a selection can be made. There are a lot of pencils out there. I have a lot more pencils than most, and far less than many. Most of those I have shown here are just a few that I have purchased and that I have little hesitation in recommending for inclusion in most artists’ travel kits, even if not a favourite of mine. Though it must be said, not necessarily within a lightweight set-up. As mentioned earlier, when limited in what I can carry, my preference is for a tone of around 2B within most pencil brands. There can be some difference between brands, but more usually evident with the darker tones. My reason for only including 2B is purely because this is a lightweight, minimalist set-up, so I only include a single pencil. What I need to then do is to get as much out of the minimal items included in my lightweight kit as I can. The above 9000 series pencils from Faber Castell are a good and easily available (in Europe) option. I find the graphite to be of a consistently high quality with no grittiness. If wishing to include an eraser, then the shorter ‘Perfect Pencil’ replacement from Faber Castell could be taken. This is a shorter pencil that will easily last a fortnight but is only purchased as a B grade. As to the Perfect Pencil itself, most other pencils, of any grade, could be slipped into the extender/sharpener that comes as part of it. For longer trips, it might be worth considering a thicker barrel of graphite, in which case one of the Faber Castell Jumbo pencils might be a good option, The lead in these is 5.3mm thick so a dedicated sharpener may be required. That produced by Faber Castell also gives a more oblique, 24°, angle to the point. These thick pencils are available in HB, 2B, 4B, 6B and 8B grades. If a thick stick of graphite is wanted, then alternatively, a lead holder could work well. I shall talk more on these on another page in this series on the subject of lightweight art kits. If even the idea of carting along a wooden casing to a pencil, that does little more than hold the graphite, is anathema to some, then a stick of woodless, pure graphite might be the answer. There are various options available from a number of manufacturers. Capable of being sharpened in a regular pencil sharpener (or with a knife), the pure graphite is normally encased in a lacquer sheath that keeps the graphite off the fingers. The woodless pencil produced by Faber Castell has earnt a place in my pencil roll for years. However I more recently came across the Rembrant Lyra Titan. This is a slightly thinner (and shorter from new) offering that will save a few grams yet still produce good results. These are particularly suited to shading large areas quickly. In fact, the Lyra Rembrant Art Specials, a collection of twelve pencils (some coloured) produced by Lyra, makes a very good set in itself. With a solid graphite pencil the whole of the graphite stick can be utilised. However a fair amount of care needs to be exercised as these pencils can break fairly easily if handled roughly or dropped. I do use a graphite stick on occasion, but my preference is for the traditional wood cased pencil. Graphite sticks do have their place, just not in my travel art set. An alternative to both the Jumbo pencils and the solid graphite sticks could be one of the uncommon, artists quality, ‘carpenters pencils’. These have a wide flat graphite core encased in a flat, octagonal wood barrel. This is a much tougher offering than the solid sticks of graphite such as the Lyra Rembrant Titan. Made in this manner, to a traditional design, the flat pencils not roll away like most round, or even hexagonal, pencils. In fact the reputedly oldest surviving pencil is one of this design. More to the point, there is a lot of graphite encased here, so lasts well. A disadvantage is that unless one of the heavy specialised carpenters pencil sharpeners is taken, these must be sharpened with a knife. Difficult to find now, these flat pencils occasionally turn up on eBay and similar. I am down to my last few. I also show a couple of the coloured variants in a later post on colour pencils. What is particularly nice about these pencils is the variety of line that is possible, from fine lines to broad strokes for quick shading. All that said, even in its cylindrical shaped barrel form, the Derwent Sketching Pencil is a tried and tested product. Charcoal, or carbon, is too friable for the trail. But some manufacturers have mixed it with with graphite, in various grades of hardness, that can produce lovely dark work. The German made Mars Lumograph black is available in 2B, 4B, 6B and 8B. Drawings with these pencils lacks the lustre, or sheen, produced by normal pencils. Note that the darker, softer tones of the standard Mars Lumograph, the 7B and 8B, also lack this sheen as the graphite is mixed with a percentage of carbon. If considering these, as always, it is best to experiment first and ensure that not only are these pencils long lasting enough for a trip, but also any smudging that results can be controlled, or is acceptable, as it is unlikely that any fixative will be carried. Staedtler Mars Lumograph 2B (3.5g) and Staedtler Mars Lumograph black 2B (5.3g). Made in Germany, both of these pencils are made to a high and consistent standard. While the smooth Mars Lumograph has the usual ‘graphite sheen’ on the paper, all of the Mars Lumograph Black has a high percentage of carbon added, giving a matt, black shading. Not all pencil graphite thicknesses are the same, for instance the two 2B versions in the Mars Lumograph series differ. While the normal graphite pencil has a 2mm graphite core, the Mars Lumograph black 2B has a thick 3.6mm core and, with care, will last longer on the trail. Note that this pencil does not lend itself to a long point profile. So an appropriate sharpener is required, or knife. If taking pencils on a longer hike, then there will obviously be the need to get as much out of them as possible. When reduced in length, pencils can become awkward and uncomfortable to use. The advantage of the mechanical pencils, with a high polymer mix to the graphite, is that the overall length of the pencil remains unchanged as the graphite gets used up and they can be used until the ‘lead’ is quite short. The clutch pencils too, can run down their lead core until quite short while still keeping their ease of use due to unaltered body length. This is not the case with a wood case pencil, so with these, a pencil extender can be useful. These come in different materials from a number of manufacturers and some are pretty heavy affairs. I have had my favourite lightweight wood pencil extender for a couple of decades and have no idea where it originated. Unless I lose it, I fully expect another couple of decades of service. 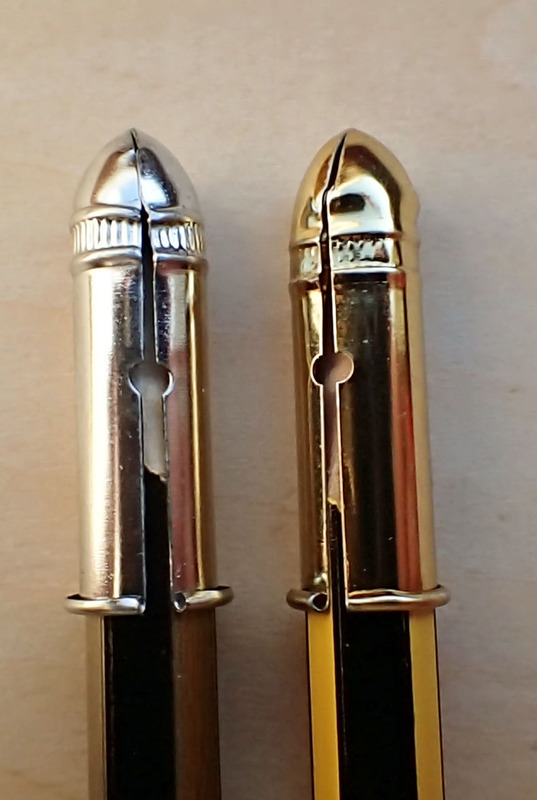 In two of the extenders shown, the pencil stub is inserted into the metal sleeve and a collar pushed toward the pencil, tightening around the shaft. Some extenders work better than others, not all extenders fit all pencil circumferences. It is best to make a pencil selection, then determine which extender fits it best. The plastic bodied extender shown here has different sized collars at each end; the wider sleeve fitting my pastel pencils well. A lovely simple and lightweight alternative to my wood and brass pencil extender is that made by Caran D’Ache. Placing the pencil in one end of the 88mm long tube, it acts as a pencil tip guard, placed in the other end, it works as a pencil extender, so double duty- result! The thin metal tube won’t take all pencil thicknesses and does scrape the paint off the side of the pencil barrels. Another thing to note is that the balance of a wood case pencil does alter entirely as it becomes both shorter, or is enclosed within any pencil extender, though that has never bothered me. If taking carrying pencils in such a manner that the points could be damaged, or more importantly if carried in a particularly lightweight pack etc., a cap on the point is a wise choice, not only to protect the pencil point but also to stop it poking holes through fragile fabrics. These really need not weigh much at all. The soft caps supplied with new paint brushes could be re-purposed if desired instead. Not all point protectors and pencil extenders fit all pencils. Not only the diameter, but also the shape of the barrel play a part in ensuring a tight, non-slipping fit. Perhaps not surprisingly, often it is accessories produced by the same manufacturer of a pencil that will provide the best fitting solution. I have also enjoyed using the water-soluble graphite pencils on occasion. I have only used those from Derwent and Faber Castell. My success with these has been varied but they are good fun to use. 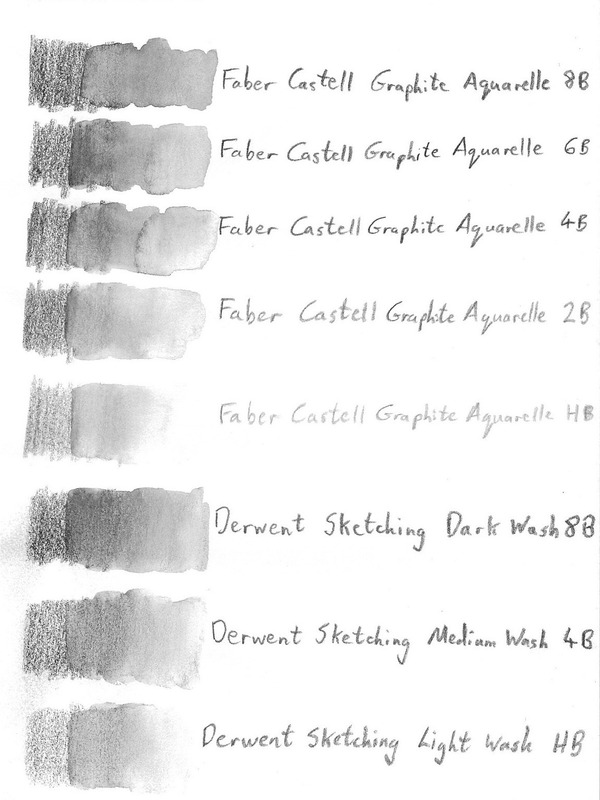 I don’t think there is much difference between the softer tones in the Faber Castell range, but you can see what a brief puddle with a waterbrush creates, below. So what pencil does Three Points of the Compass include in his lightweight art kit? Most of those shown here have accompanied me on my travels at one time or another. My choice may very well be different to yours, everyone’s preference is personal to them. I will reveal more in a later page in this series. Part 2 will look at Mechanical Pencils.